This is a sensory weighted blanket. The blanket comes in 15 pounds and measurements are in inches. The blanket is reinforced around all the sides and the weight inside the blanket is evenly spread and unable to gather in just one area. Individual sections are typically approx 6x6 inches. This is filled with non toxic poly pellets and can be washed in a washing machine and dried in a clothes dryer. This is a very durable blanket. By completing the checkout process you are agreeing to the following TERMS AND CONDITIONS OF THE SALE. Please know that our #1 goal is to keep everyone, especially your children SAFE and HAPPY. Weighted Blankets should be used as part of therapy. No one should EVER be forced to use a weight product, or wrapped/swaddled in one, nor should a weighted blanket be used over someones head and/or face area. 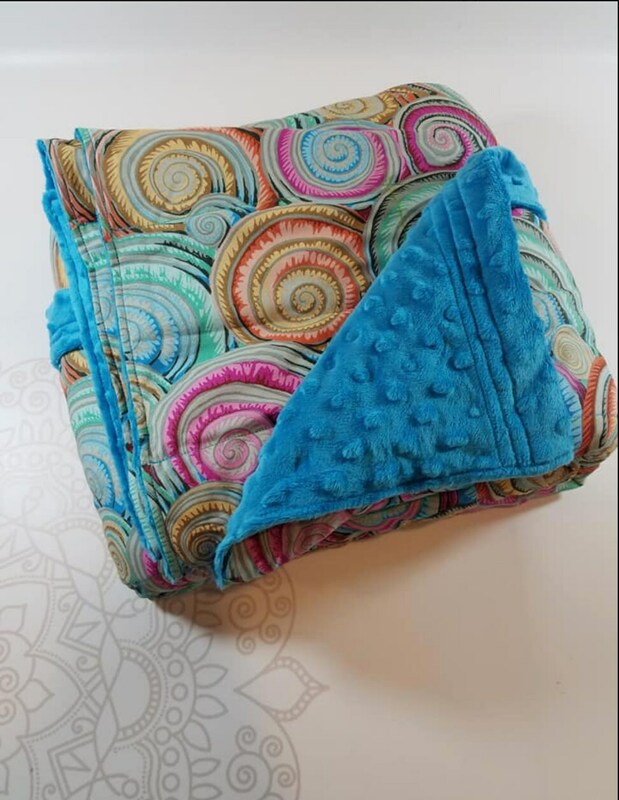 Weighted Blankets should be made available to the individual and used as a tool for comfort as they feel the need. Do not use on infants under 3 months of age ever, or on infants under one year without consulting with your physician, persons with serious lung conditions or difficulty breathing, without consent and direction of a physician. Please consult your physician, clinician, or therapist with any questions about specific individual use. If poly-pellets should release from a Blanket due to damage, or long-term wear, they are not harmful, but can be a choking hazard, and care should be taken to make sure they are not ingested, as is the case with any non-edible item. NamasteHandMade manufactures products only and cannot give advice on Therapy. We will make each product to order based on your order & specifications. The formula we recommend is 10% of body weight + 1 lb, is the industry standard, and has been suggested by many therapists. We are not your licensed therapists. To ensure you have the correct weight for your needs, please contact your doctor, clinician or therapist. NamasteHandMade takes every precaution to ensure a quality product. Please inspect for defect or damage before use. If noted please discontinue use immediately. Products are completely encased and all exterior seams are double stitched for your safety. If you notice a tear, especially one exposing pellets, discontinue use until repair or replacement can be made. Do not ever place our products in the Microwave Oven as they could cause serious burns or a fire. Also heat such as the oven or direct heat from sources such as an iron will cause damage. If you would like to warm your blanket, we recommend placing it in the clothes dryer for 10-20 minutes as the ONLY way to warm it. PLEASE READ THE FOLLOWING TERMS AND CONDITIONS OF USE CAREFULLY BEFORE PURCHASING. If you do not agree to these terms and conditions, please do not purchase. This site and the materials and products on this site are provided "as is" and without warranties of any kind, whether express or implied. To the fullest extent permissible pursuant to applicable law, NamasteHandMade disclaims all warranties, express or implied, including, but not limited to, implied warranties of merchantability and fitness for a particular purpose and non-infringement. NamasteHandMade shall not be liable for any special or consequential damages that result from the use of, or the inability to use, the materials on this listing or the performance of the products, even if NamasteHandMade has been advised of the possibility of such damages. Applicable law may not allow the limitation of exclusion of liability or incidental or consequential damages, so the above limitation or exclusion may not apply to you. You agree that jurisdiction over and venue in any legal proceeding directly or indirectly arising out of or relating to this purchase (including but not limited to the purchase of NamasteHandMade products) shall be in the state or federal courts located in the owners home county and state. Any cause of action or claim you may have with respect to this purchase (including but not limited to the purchase of NamasteHandMade products) must be commenced within one (1) year after the claim or cause of action arises. NamasteHandMade's failure to insist upon or enforce strict performance of any provision of these terms and conditions shall not be construed as a waiver of any provision or right. Neither the course of conduct between the parties nor trade practice shall act to modify any of these terms and conditions. NamasteHandMade may assign its rights and duties under this Agreement to any party at any time without notice to you. You agree to indemnify, defend, and hold harmless NamasteHandMade, its officers, directors, employees, agents, licensors and suppliers (collectively the "Service Providers") from and against all losses, expenses, damages and costs, including reasonable attorneys' fees, resulting from any violation of these terms and conditions or any activity related to your account (including negligent or wrongful conduct) by you or any other person accessing the site using your Internet account. NamasteHandMade products are not licensed products of the copyright/trademark owners of the fabrics used. Our products however may be hand-crafted from licensed fabric. With the exception of the fabric, the blankets and other products are not affiliated/connected with, or sponsored in any way with the copyright/trademark owners. We take pride in our products and workmanship, and stand behind our products and quality of work. If for any reason you are not happy with your purchase, please contact us. This blanket is hand made and to ensure straight lines and even weight distribution we use a non toxic chalk to mark our sewing lines. Please be aware that your blanket will have visible lines that will disappear either with use, or after washing blanket in a washing machine. This is a cosmetic feature that does not alter the effectiveness of the blanket. Color of lines may be any of the following: white, cream, yellow, blue, red, orange, or purple. We select the color of chalk used based on the color of your fabric selection. We cannot accept requests on color of chalk used. Thank you for understanding. We do not use any "poly fil," liners, extra layers of fabric, or "fluff" in our blankets. 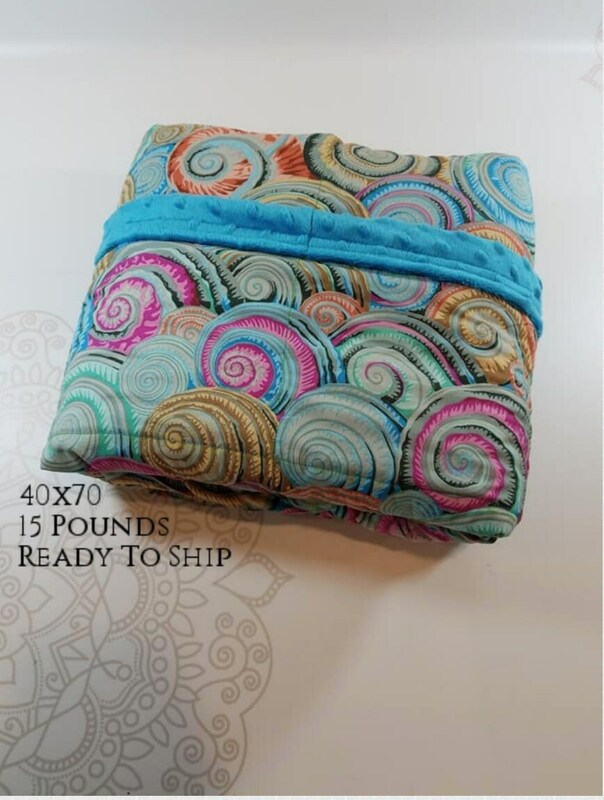 Allergens, potential for mold growth if not laundered and dried properly, potential for a host of complications for your new weighted blanket would be present if we altered our blanket design. 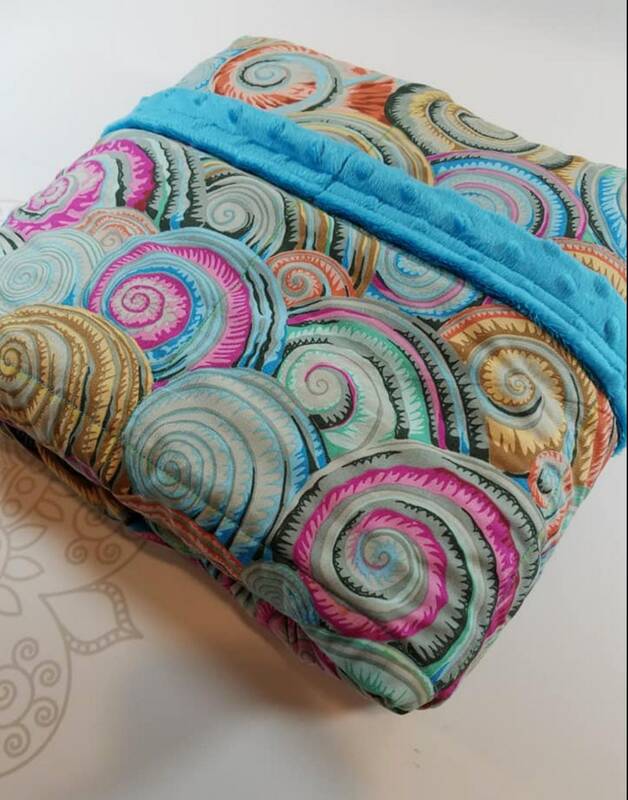 Please note that your weighted blanket from Namaste Hand Made LLC will be constructed of 2 layers of fabric (one layer for the "front" and one layer for the "back. "), and weight filling. If you desire a "thicker" blanket or one with "stuffing" or "fluff" we could recommend purchasing elsewhere. Our main goal is the safety of our blanket users. While we strive to make a beautiful blanket for you, we are making and providing a sensory tool/blanket with a purpose. All the extra components are not necessary for the primary function of a weighted blanket. Also, at this time...unless specifically discussed prior to blanket purchase we do not accept custom thread color choices. We will use a matching/complimenting/ or neutral thread color for your new blanket. If the color of thread is important to you we will be happy to discuss your color preferences PRIOR to your blanket purchase otherwise thread color is left at our discretion. As with any handmade item, there will be some variation on inch measurement and weight. Tape measures, quilting rules, yard sticks, and other measuring tools can and will measure an "inch" a bit different. We do our best to produce your finished product as close to the advertised dimension and weight as possible. Also, to ensure that your item remains in NEW condition, and to avoid any ALLERGY interactions, we DO NOT PREWASH FABRIC. After you receive your item, should you choose to wash-please note, the majority of our products are made with cotton or other natural fibers that can shrink during the laundering process. We collect information from you when you place an order. Name, Shipping Address, Order Information, and Etsy's third party payment processing system collects your payment information. When ordering or registering on this site, as appropriate, you may be asked to enter your: name, e-mail address, mailing address, phone number or credit card information. After a transaction, your private information (credit cards) are processed through Etsy and their third party payment processing. Our shop has no access to your financial information, ever. We do not sell, trade, or otherwise transfer to outside parties your personally identifiable information. We may also release your information when we believe release is appropriate to comply with the law, enforce our site policies, or protect ours or others rights, property, or safety. Custom orders are gladly accepted. If interested simply send a message with your request and you will be accommodated accordingly. We look forward to the opportunity to make a weighted blanket for you or your loved one. All weighted items are MACHINE WASHABLE and DRYER SAFE. Wash with like colors, or separate on gentle cycle and dry on low heat in the dryer. Please refer to your machines manufactures suggestions on weight capacity before washing in your home appliances. Heavier blankets may require the use of an industrial washing machine, and dryer. Namaste Hand Made is proud to offer bulk pricing to educational facilities, foster care systems, and therapy centers. Please send a message in regards to pricing as prices vary with specific needs in weight and volume of blankets/items required.